We woke up at 6am and left at about 8 that day. This was a very difficult day, and it’s good we started early. At 16 kilometres and just over ten hours, it was an arduous day to say the least. We went up and down and up and down the mountains, along the peaks, and then finally back down to sea level. While I have fairly good endurance and can walk as fast or faster than Andrew and Tom on flat land, the uphills are particularly difficult for me. I fell behind quite often on the uphills but every once in a while Tom and Andrew would stop and wait for me to catch up. We had some interesting crossings this day as well – in particular one stream about 6 feet wide. About 11am, we found this stream and there was no way across. The water was a solid 3 feet deep and none of us felt like wading through it. Nor did we fancy the 6 foot climb down into the stream and the 6 feet to claw ourselves up the other bank. Both banks were steep muddy slopes and we could see the marks of hikers who had less luck than us navigating this crossing. Tom jumped first then Andrew threw each of our 3 heavy packs across to Tom who caught and threw each one further up the path in a single fluid motion. It worked nicely and we were on our way, having caught it all on video. Just after 5pm, we reached the top of the last mountain of the day and stopped for a few minutes and some photos. What a beautiful place it was, looking down towards Doughboy Bay and all around us mountain peaks. With high spirits, we began the long and mostly extremely steep descent to sea level. An hour later, nearing the bottom, we stopped for a minute to breathe and enjoy the view. Andrew realized at this point that he no longer had his camera – he apparently put it down at the top of the mountain and forgot to pick it up when we began our descent. He and Tom decided to try finding it while I continued on to start the rice cooking. They left their bags in the bushes and I went on alone down the remainder of the trail. 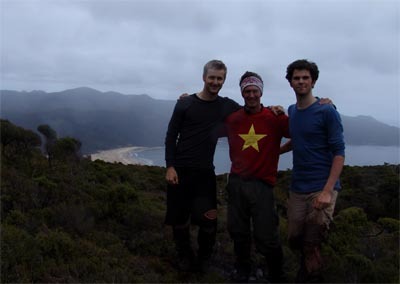 About 10 minutes after I had arrived at Doughboy Bay Hut, Andrew and Tom arrived. I had taken my sweet time once I was alone, stopping to take photos and enjoy the scenery and lack of rush. They had gone full tilt partway up and back down the mountain with no success in locating the camera. Down at the hut, I walked up to my calves in water and did my best to clean the mud off, without much success. I cleaned my shoes and gaiters and returned to the hut where my legs began to itch crazily. I coated them in Andrew’s anti-itch powder but this didn’t help. About half an hour later they finally returned to normal. We made rice with broccoli and carrots for supper and went to bed after Andrew got ‘attacked’ by a possum. In reality Andrew’s screams sent the possum running, and possums are not dangerous or scary, but Andrew assures us that the possum ran at him. Sure Andrew, sure. The hut was fairly full, as two people were there from the previous day and two others arrived after dark, making seven of us. The other four were all going the opposite direction on the track. In the middle of the night I awoke as usual to relieve myself outside and there were two possums there this time. I scared them off just by looking at them :-) It’s nice knowing there are no predators in New Zealand (except the human type of course). 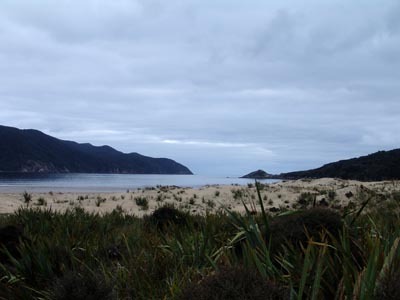 This entry was posted in New Zealand, Oceania, Travel and tagged Hiking, Possums, Stewart Island.